was not teased, or judged, or mocked, or ridiculed because of it. Allow me to rewind a little bit. I am a Car detailer at a dealership. I clean cars; inside and out. It is not a special job, nor a hard job, but it has been a good job. In my department, there are about 8 of us; from different backgrounds, and most of whom are not Christians. It was a co-worker’s birthday, and also the last day in which all of us would be working together. ( Due to some major schedule changes) So one person brought in a cake, and we took some group pictures. And he asked me to pray before he cut the cake. no time to feel awkward or hesitant or shy. So, I just dove right in, as everyone bowed their heads. God opened a door, where I wouldn’t even think to knock in the first place. I was surprised by how NOT awkward that moment was. I am blessed by the people I work with; Christian or not. I can only hope I am some semblance of the light of Christ, in this dark world. The one year anniversary was June. So are the days of our lives. I am guilty of that in most aspects of my life. Wanting – intending – to plan something ahead of time; a birthday event, a gift, a favor, etc. ; but then procrastinating until it is too late. And instead of showing love to the ones I love most, in a creative and intentional way, they get a big, fat rock. 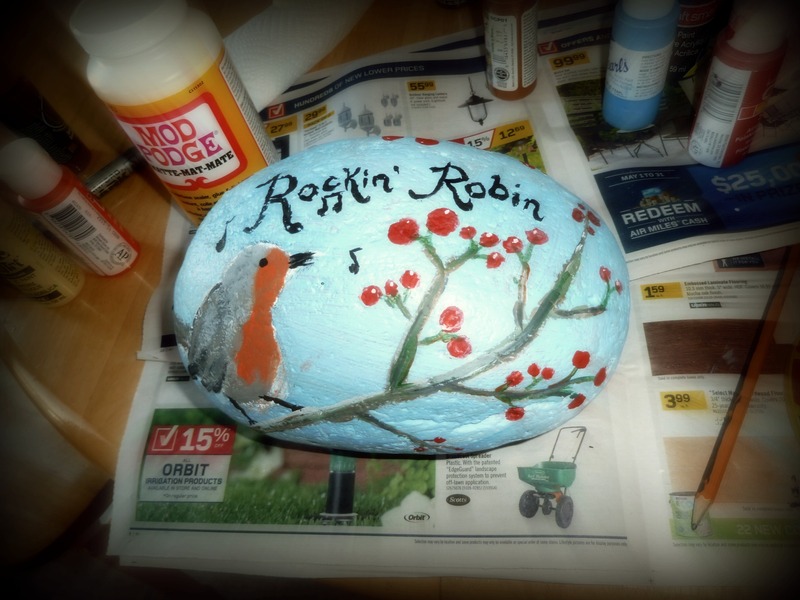 Thankfully, (and as I of course, already knew) my Mom loves homemade gifts, and thus, loved my “Rockin’ Robin” painted rock. But I know eventually, this procrastination must cease. Or at the very least, decrease considerably. I’m slowly learning to go forth, and actually DO. Over a year ago, I knew the best way to do my devotionals consistently, was to add it to my morning routine. Over a week ago, I added exercise to my morning routine. I think that’s a good word for the day, don’t you?